ABUJA—Barely 24 hours after he was remanded in the custody of Economic and Financial Crimes Commission, EFCC, former Secretary to the Government of the Federation, SGF, Babachir Lawal, secured bail from an Abuja High Court sitting at Maitama, yesterday. The court, in a ruling by trial Justice Jude Okeke, granted the ex-SGF, who is facing trial over alleged complicity in a N272 million contract fraud, bail to the tune of N50 million with one surety in like sum. Justice Okeke handed the same bail condition to Lawal’s three alleged accomplices in the fraud, Hamidu David Lawal, Sulaiman Abubakar and Apeh John. The court stressed that the sureties must not only be owners of landed property within the Federal Capital Territory, but must show evidence of payment of tax for the past three years. Besides, the court directed the defendants, who are answering to a 10-count criminal charge the EFCC preferred against them, to surrender their international passports, even as it barred them from travelling out of the country without permission. Pending the fulfilment of the bail conditions, the trial court held that the defendants should remain in EFCC custody. Justice Okeke further fixed March 18 for full-blown hearing of the case against the defendants. The court had in its ruling, rejected the former SGF’s plea to be granted bail on self-recognizance. It will be recalled that Lawal, whose arraignment came about two years after he was accused of illegal diverting of a contract the Presidential Initiative for North East, PINE, awarded for the removal of grasses in Internally Displaced Persons, IDP, camps, to his own company, pleaded not guilty to the charge. 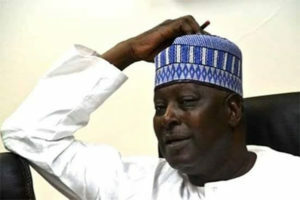 EFCC had through its lawyer, Mr. M. S. Abubakar, opposed the ex-SGF’s request to be allowed on bail. The agency contended that Lawal and his alleged accomplices, were unable to present sufficient materials to enable the court to exercise its discreationary powers to grant them bail.